Order the Advair Inhaler through our trusted Canadian pharmacy at an unbeatable price. We currently have the brand Advair Inhaler from Indian, New Zealand and Turkey manufactured by GSK. 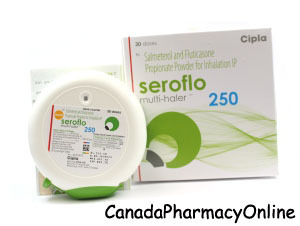 The generic Fluticasone/Salmeterol also called Seroflo comes from India and is manufactured by Cipla. It is available in the strength of 50 mcg/25mcg/120 dose, 125mcg/25mcg/120 dose, and 250 mcg/25 mcg/120 dose inhalers. For other asthma medications, please call Customer Service at 1866-920-3784. Advair Inhaler (Fluticasone/Salmeterol) is a prescription medication that is used to prevent asthma attacks. It may also be used to prevent flare-ups or worsening of COPD. Fluticasone is a steroid that prevents the release of chemicals in the body that causes inflammation. Salmeterol is a bronchodilator and it works by relaxing muscles in the airways to improve breathing. Advair is used as a long term treatment in people with COPD but in people with asthma, it is used as a short-term treatment until the symptoms are under control. Advair HFA inhaler is used in adults and children who are at least 12 years old. You should not use Advair inhaler if you are allergic to Fluticasone or Salmeterol. Before you start taking this medication, talk to your doctor about your medical history and about all the medications you take including OTC and herbal medications. This medication should not be used during pregnancy unless it is clearly needed. It is unknown if this medication passes into breast milk. There may be an interaction between Advair inhaler and other medications such as alfuzosin, amiodarone, atomoxetine, betahistine, caffeine, chloroquine, cyclosporine, digoxin, diltiazem, dopamine, grapefruit juice, quinine, tacrolimus, tetracycline, etc.